How Real Are the Shamans Of the Xenaverse? There is so much material related to the two-part episode ADVENTURES IN THE SIN TRADE (69-70/401-402), and I am very grateful to those who have also written about it, especially Kathleen Leigeb's "We Can Fly, We Can Fly" (http://whoosh.org/issue32/leitgeb1.html). I am going to emphasize the history of the Altai and related people, their beliefs, and ceremonial clothing as it relates to ADVENTURES IN THE SIN TRADE . The Altai people originated in what is now Korea, and they swept across Asia into what is now Turkey. The Altaic language group includes Finnish, Hungarian, Turkish and Korean. The Altai in Siberia would have been contemporary with many of those Xena knew in Asia Minor (Turkey), and therefore, presumably with Xena. They practiced Shamanism, a belief system that seems to elude even the wisest among us because it is not similar to other religions. It is not Buddhism, Christianity, nor a book related religion at all. It has no avatars, no catechism, and no dualism (no evil demon to fight against ultimate good). To grasp Shamanism, you must rid your mind of all expectations as to what a religion is. Shamans are healers. It is that simple and that complicated. They heal by going into another place. That other place cannot be seen, felt with the hands, or photographed, but to the Shaman it is utterly real. This is shown in SIN TRADE (69-70/401-402). This place has a very specific geography. There is a world above, which was reached by the Altaic Shamans by climbing a virtual birch tree. There was a world below, which was under cascades of water, under a waterfall, as in THE BITTER SUITE (58/312), or inside a cave. The rest of it rather resembled our waking world, but not entirely. Again, the depiction in SIN TRADE is quite accurate. When Xena set off to enter the Land of the Dead, she knew she was doing something dangerous. What she did not know was that having Alti as a teacher put her in double jeopardy, since Alti was what was called a "Black Shaman". 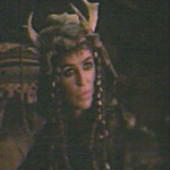 Alti used real blood sacrifices, including human sacrifice, to do her traveling to the Land of the Dead. Real Shamans used reindeer blood, red ochre clay, or chewed alder bark, as was shown in this scene from Pathfinder (1987, Nils Gaup), a film about the Saami people of Arctic Europe. Here the female shaman is chewing the alder bark, preparing to make ceremonial "blood". Since Xena was unaware that this option was open to her, she killed a horse to enter the Land of the Dead, and the journey was more difficult than it needed to be. It seemed especially emotional for her because of her attachment to her own horse Argo. Without the proper training, Xena took the most dangerous route into the other world, but since her heart was right, she survived and helped others. One huge issue I have with SIN TRADE (69-70/401-402) is the Berserker character. A Berserker is actually a practitioner of an Odinic rite that makes a warrior crazed with battle lust and unmanageable when the battle is over. They often will fight their own troops, not knowing friend from foe. There are sagas in which Odin shapeshifts. His followers would don shirts of bear or wolf skins and dance themselves into a frenzy. While the frenzy was upon them, they felt no pain, fought ferociously, and sometimes would turn on their own men. "It is likely that the berserk was actually a member of the cult of Odin. The practices of such a religion would have been a secret of the cult's initiates, although the Byzantine emperor Constantine VII refers in his Book of Ceremonies to a, "Gothic dance" performed by members of his Varangian guard, who took part wearing animal skins and masks: This may have been connected with berserker rites". -- Hallakarva, Gunnora "Berserkergang" Tournaments Illuminated July, 1987. A traditional berserker. The SIN TRADE berserker smacked of ceremonial magic, a thing looked down on by most shamans. Much discussion has ensued about the authenticity of the shamans and what they wore in ADVENTURES IN THE SIN TRADE (69-70/401-402). Some people were confused by the similarity of Xena's garb to Native American clothing. Searching the pages of The Red Road a.k.a. The Wallum Olam , which is the Delaware history beginning when the Delawares crossed from Siberia to Alaska on a sheet of ice, is enough to account for some similarity between Native American and Siberian clothing. Also, due to the size and shape of animal skins used in clothing, a certain similarity in the resulting garb is inevitable. Xena's Shaman gown from SIN TRADE, and an authentic Siberian shaman gown. Let us look at some costume details from ADVENTURES IN THE SIN TRADE (69-70/401-402) and historical shamans. Above we see both Xena's Shaman gown from SIN TRADE and an authentic Siberian shaman gown. Note the similar styles. Both gowns are leather, are decorated with symbols on the sleeves, have a heavily decorated breastpiece, and feature special headgear. Pay particular attention to the sleeves (below). Why is the one Xena wears so different from the one in the authentic picture? One answer is that indigenous people have a very strong idea of intellectual property. A symbol of this type belonged to the Shaman, or his/her family or clan. The symbol on Xena's sleeve is a Celtic snake with its tail in its mouth, and Lucy Lawless' maiden name is Ryan, an Irish (Celtic) name, so the symbol is one she may use freely. Now look at the breastcovers (below). One is tribal, and other is a stylized replica of the correct shape and function. Look at those breast plates! One particular item of clothing caused many to doubt authenticity. That was the little antlers on the headresses of Atli and Xena. The following pictures should clear that up. First is a photo of the SIN TRADE headress. Next is a photo of the Silla (Korean Altaic) Kingdom. It is a gold rendering of the antler headress, plus the sacred birch tree. As you can see, the antlered crown of gold must have come from a real antlered crown sometime in the past. Alti, in all her horned glory. The crown of the Silla Kingdom in Korea shows the traditional deer antlers of the shaman, plus the birch tree. CLICK HERE to see an enlargement of this graphic. Below is a drum face. These did not appear in the Xena episode. Drums may have been skipped in SIN TRADE (69-70/401-402) in an effort to show cultural sensitivity, or they may have just been too difficult to have on the set with the action going on. Drums are the instrument the Shaman uses to enter the trance state, and so they are the "mare" the shaman rides to other worlds. The drum face shows the Shaman traveling in those other worlds. The center is the sun symbol. The top is the tree going to the World Above, the bottom goes to the World Below, and the others go to the World We are Upon. The Shaman was buried by hanging him/her from a tree, with their sacred tools, including the drum, so the tree burials in SIN TRADE (69-70/401-402) are authentic. The scenes showing Alti and Xena flying were exciting, but did Shamans fly? As you can see, they flew on their own power and on the backs of animals in the Otherworld. The Otherworld is another dimension in which Shamans move about to do their healing work. Only a, "Black" Shaman would do harm to others. One feature of Korean Shamanism that struck me as I watched SIN TRADE (69-70/401-402) was the use of a different colored horse. This is the second time that Xena rode a horse of a different color. The horse she rode in the "Gab Drag" from THE BITTER SUITE (58/312) was dark, as was the one she rode in SIN TRADE. Argo is light. The dark horse in Korean Shamanism represents the power of the earth. The white horse represents heavenly powers. We can see that much more research went into the production of ADVENTURES IN THE SIN TRADE (69-70/401-402) than many of us might have thought. I also have more information on this subject on my web page at Shaman Text in Xena: Warrior Princess (http://blarg.net/~simahoyo/shamantxt.htm). Linda Knighton, also known as Simahoyo, is a resident of Seattle. She holds a BA in historical research from Boise State University, was a member of the Society for Creative Anachronism, and a title searcher. She now works in Washington State Politics as a fundraiser for Washington State NARAL. She is the former Co-chair of the Association of Southeastern Tribes, a member of the Pan-American Indian Association, and is active in Native Community activities. Simahoyo is currently writing a novel set in Germany in the Sixth Century.